Need help deciding on which product you need? See the Which servo driver and Which frog juicer decision tables. Skill Level: Advanced - requires knowledge of loconet, JMRI (or equivalent) and willingness to read instructions. 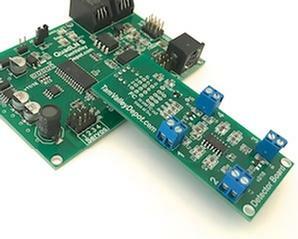 4 expansion outputs can be used to drive 5V relay boards or to drive 4 more servos and to drive up to 24 LEDs using the optional Signal Board. Want to integrate turnouts with a CTC panel? Control a yard ladder with a single command? This is the decoder for you. The QuadLN software was developed by N3IX Engineering. The features of the QuadLN are far too numerous to fully explain here - download the manual for a fuller explanation. 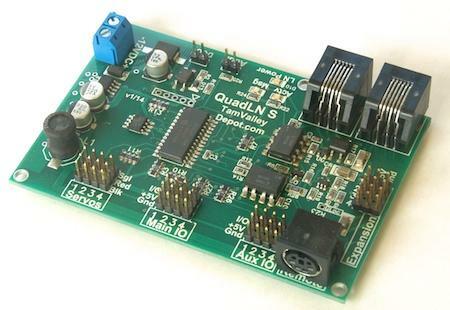 QuadLN_S servo driver and loconet decoder board (servos, fascia controllers and other accessories not included). The QuadLN_S requires JMRI 3.8 or later. For JMRI version 3.8 through 3.9.1, place this updated decoder file in your ProgramFile/xml/decoders folder, overwriting the existing file. For JMRI 3.9.2 and later no update is needed, the latest QuadLN_S decoder file is included. Used with the QuadLN_S (above) for alignment of servos. Just one of these needed for all of your QuadLN_Ss. Comes with a 10' cable which allows you to stand next to your turnout while aligning the servo - no more acrobatics and hanging upside down below the layout! Board is 2.7" x 1.7" in size. We have designed a 24-output signal board for the expansion port. Each board can drive up to 24 LEDs. Any mix of single, Common Cathode, Common Anode and 2-Lead Bicolor LEDs can be used. Each output comes equipped with an internal resistor (330 Ohms) and there are mounting points for a user supplied resistor (the two holes above the numbers in the picture) to increase the LED drive range for LEDs with special drive requirements. 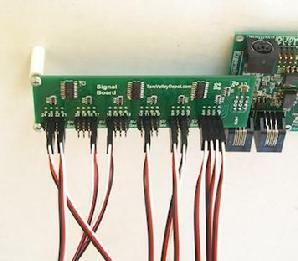 Each signal output is brought out to a 3-pin header that also supplies 5V and ground, matching the 3-pin servo extension cables for easy wiring. In addition to software LED brightness adjustment, the QuadLN_S provides full signaling support. There are very realistic fade, Searchlight transition effects and CPL semaphore effect. Flashing signal aspects. Flashing grade crossing with cross fade. 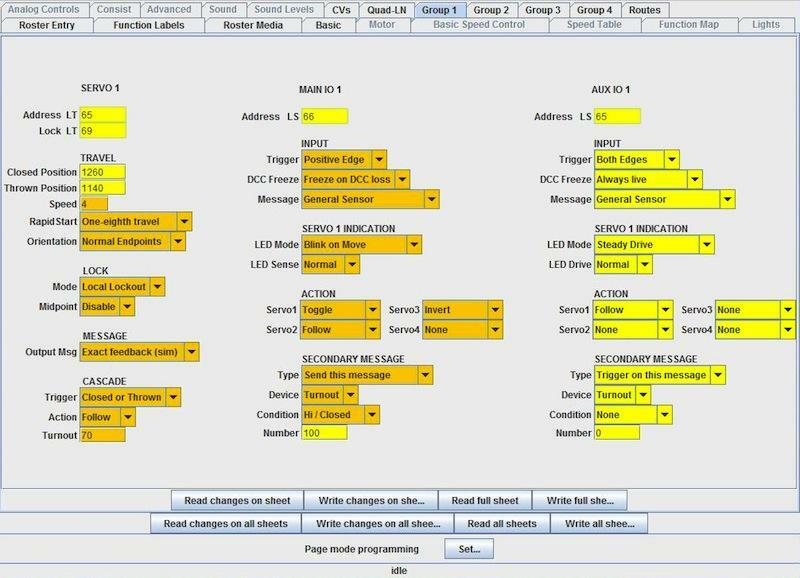 Up to 48 signal aspects can be configured. Signal control via NMRA Signal Head/Mast messages or Turnout Controlled Mast messages. The QuadLN_S Signaling Manual has all the details - download it here. This animated gif shows the Signal Board effects in action. The sequence goes from green to yellow. Note the red flash in between imitating the way the red lens on the prototype briefly came into view as the signal switched; the prototype had the red lens between the green and yellow. 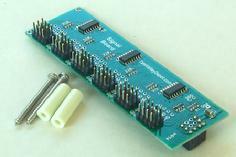 Signal Board comes with standoffs and screws for mounting. Plugs in to the expansion port of the QuadLN_S to provide for 24 LEDs to drive signals. Board is 4.25" x 1.35" in size. Extends 3.6" from QuadLN_S. 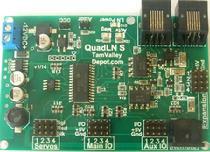 This board can add 4 detection blocks to the Quad-LN. 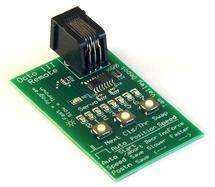 The detection is current based using transfomers that detect current on the DCC feed. The board plugs in to the I?O port on the QuadLN_S. A new version of the firmware is needed to us the board. Older boards can be updated by uploading the firmware from JMRI over LocoNet. 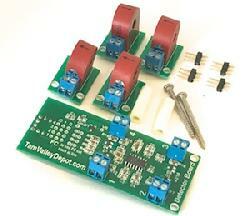 The detection transformers are mounted on a small PC board with a screw block to make hook up easier. The wire feeding DCC to the block is inserted through the hole (just once). Sensitivity can be adjusted using the QuadLN_S remote aligner (see above). A fascia controller can still be used on the port the board is plugged in to by adding a 3-pin headers and cutting a trace. Board comes with 4 transformers and hardware for mounting. 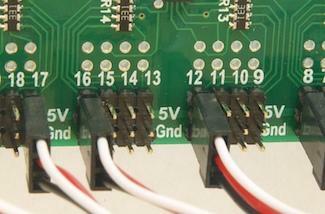 Plugs in to the Main I/O port of the QuadLN_S to provide for 4 current detection blocks. LEDs to drive signals. Board is 3.00" x 1.30" in size. Extends 2.5" from QuadLN_S. Transformer board is 1.0" x 0.7" and .90" tall. You get four of these (minus the quarter) and a QuadLN. QuadLN_S servo driver and four of the Micro Switch Machines. 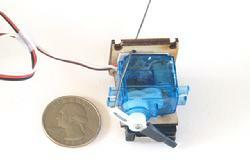 The micro Switch Machine has a snap-switch for powering the frogs. A DPDT relay for using on a Y cable in conjunction with a fascia controller. (Will also work without the fascia controller.) Has a 6-pin connector block to simplify wiring. High-sensitivity coil requires 30 mA. 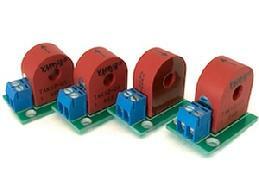 The contacts are rated 1 Amp at 24VDC. [Can also be used without the Octopus - red wire, 5V, black wire, ground, white wire, signal (0V = OFF, greater than 1.4V is ON).] 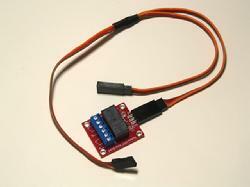 Comes with a 12" Y cable - extra length can be added with servo extensions. 12V 5A 60W switching power supply. Best for powering the Octo III. This unit will power up to 4 Octo IIIs fully loaded with servos. Plug size is 5.5/2.1 mm. 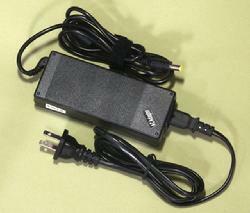 Power supply comes with a US 110V plug. By swapping the power cord can be used with 100-240V~50/60Hz power. If you don't want cut and strip the wire ends use the power jack to screw terminal adapter below. 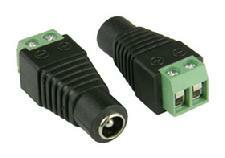 This adapter mates with the 12V power supplies to make them easy to hook up to wires using the screw terminals. Jack size is 5.5/2.1 mm. Plus and minus terminals are marked. Price is for one adapter - picture shows two to illustrate both ends. Need the manual for the older QuadLN - click on the image to the left to download.